Curassows are chicken- to turkey-sized, heavily built birds that spend most of their time on the forest floor. Their plumage is mostly black but they sport colorful, sometimes elaborate wattles (think hood ornament) at the base of the bill. 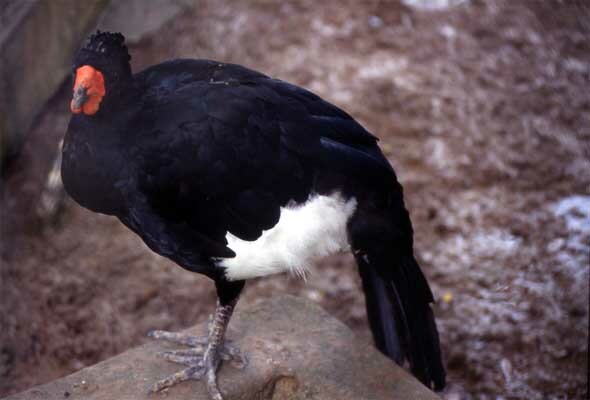 The Wattled Curassow (Crax globulosa) belongs to the family Cracidae (see also Spix's Guan). Unlike most members of the family, this species rarely comes to ground. The red adornments at the base of the bill are more pronounced in males, and presumably play a role in courtship. 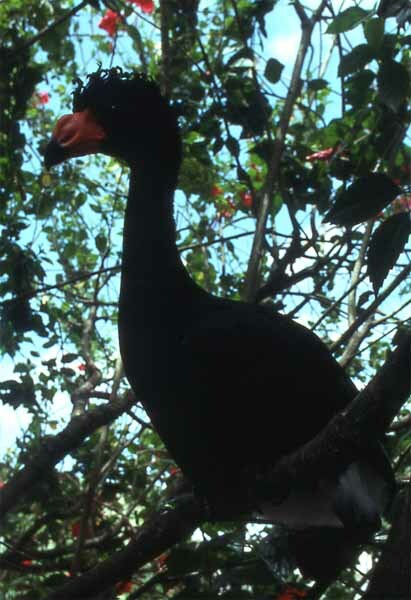 This curassow in a tree is somewhat uncharacteristic as they are typically ground birds. Note the relatively small bill "wattles" compared to the one pictured above (this may therefore be a female or juvenile male). In this picture you can more easily see this species' well-developed curly crest feathers.